Begin in style travelling on with the Rocky Mountaineer to Banff. In Banff take a boat ride along the Bow River and explore the many self-guided walking trails. Travel along the Icefield's Parkway to Jasper, one of the world's most spectacular drives. Stops include the Athabasca Glacier and Lake Louise. 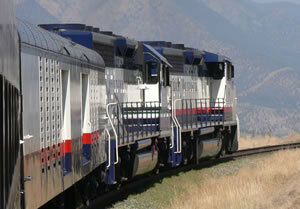 Ride VIA Rail’s “Skeena Train” to Prince Rupert before setting sail on the BC Ferries to Port Hardy. Travel south on Vancouver Island tolovely Victoria. This 13-day tour ends with a memorable afternoon visiting the famous Butchart Gardens. Accommodation in clean and comfortable hotels with private facilities, meals as indicated (B=breakfast, L=lunch, D=dinner), Rocky Mountaineer Rail (Silverleaf Service), Icefields Parkway Tour & Ice Explorer Ride, Explore Jasper & Maligne Lake Cruise, VIA Rail SkeenaTrain (Economy Class), BC Ferriesfare: Prince Rupert/Port Hardy, Greyhound coach transfer Port Hardy/Victoria, Deluxe Victoria City Tour & Butchart Gardens, Pacific Coach Lines transfer Victoria/Vancouver Airport or city, Brewster coach transfer: Banff/Lake Louise. Day at leisure to explore attractions such as Bow River Falls, Banff Gondola, Banff Springs Hotel and Sunshine Meadows. Depart the Jasper bus terminal for a short tour of the town before heading across the Athabasca River to Maligne Canyon. Take a stroll beside the narrow limestone gorge and cross the two bridges of the canyon to view the waterfalls below. At Maligne Lake a 1.5 hour guided cruise provides unobstructed views of the magnificent shoreline. Discover Victoria’s rich history and scenic beauty on a tour of this charming provincial capital. Driving through the stately downtown core you will see Government Street, the Legislative Buildings, Canada's oldest Chinatown and the last remnants of Fort Victoria. Approximately 35 minutes from downtown, The Butchart Gardens features over 55 acres of meticulously manicured grounds. 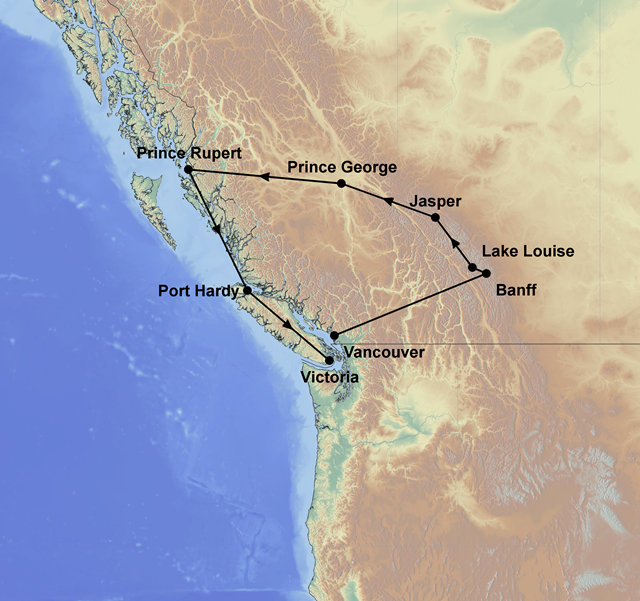 Transfer by Pacific Coach Lines to Vancouver Airport or city.